May 23rd, 2018, Dubai,UAE - As the Official Timekeeper of the Volvo Ocean Race, OMEGA has been keeping a precise eye on this year's action at sea. 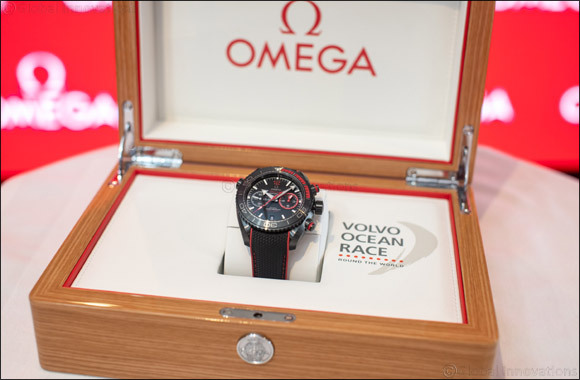 The sailors have now stopped in Newport, Rhode Island, to complete Leg 8 of the race, and OMEGA celebrated the moment by unveiling its newly-designed winner's watch. The Seamaster Planet Ocean Deep Black “Volvo Ocean Race” Limited Edition will be presented to the winning team of this year's race when it concludes in The Hague in June. The timepiece will also be available publicly, but only 73 models have been created overall (in tribute to the year that the Ocean Race first began). The 45.50 mm timepiece is a divers' chronograph with a black rubber strap, yet its strong design is just as capable of withstanding the extreme pressures of ocean sailing. The casebody has been crafted from black ceramic, while red rubber has been used to cover the first 15 minutes of the unidirectional bezel. Liquidmetal™ then completes the rest of the diving scale. The brushed black ceramic dial includes each Limited Edition number, as well as 18K white gold hour-minute hands and indexes. On the subdial at 3 o'clock, OMEGA has included a red Volvo Ocean Race ring with coloured hands and number 12. Another reference to the event can be found on the oriented caseback, where OMEGA has included the official “Volvo Ocean Race” logo. Finally, it's important to note that the winner's watch reaches the pinnacle of precision, thanks to its OMEGA Master Chronometer calibre 9900. Having passed the 8 rigorous tests set by the Swiss Federal Institute of Metrology (METAS), this Master Chronometer certification represents the highest standard of performance in the Swiss watch industry.